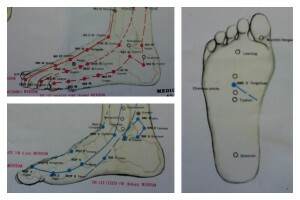 It is always fun to study the foot maps with my clients! It is a great opportunity to think about where our body needs a little extra support and how we can provide it. I thought I would share some of my favourite maps! 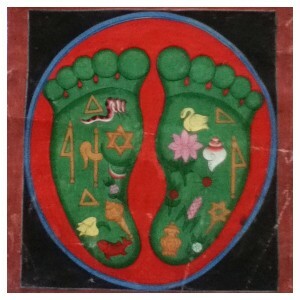 This foot map is one of my favourites and was brought back from Nepal by a friend in ’98, when I was first studying reflexology. It clearly shows that various significances are attributed to different parts of the foot in other cultures too. Beautiful colours. Reflexologists use maps like this to ensure that each of the reflexes, corresponding to each part of the body, is gently worked. We note reflexes which feel congested or depleted, and use massage techniques to create greater balance across the systems. Often we find that what we see in the foot, is reflected in the body – or visa versa! Because my background is in Energy Medicine (Jin Shin Jyutsu and Kinesiology) I also have the Meridian maps (above) in my minds eye while I am treating. The meridians are channels/pathways of energy which begin or end in the feet and hands, and promoting a smooth and balanced flow of energy through these channels has a wonderful effect on our health and wellbeing.